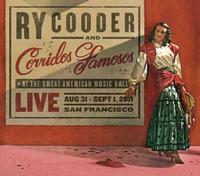 Ry Cooder's first live record in more than 35 years, Live in San Francisco was recorded in 2011 during a special two-night engagement with the Corridos Famosos band and a ten-piece Mexican brass band at San Francisco's Great American Music Hall. "One of those nights when you wish you'd been in Row A," says the Times of London. The album, produced by Cooder, includes original songs and interpretations of other material from throughout his career, as well as Sam the Sham and the Pharaohs' "Wooly Bully" and Lead Belly's "Goodnight Irene." The vinyl edition includes the album on two 140-gram LPs plus a CD in the sleeve.